1 1/2 lb. Loaf Non-Stick Aluminized Steel Bread Pan - 10" x 5" x 3"
Fill your bakery, restaurant, or cafe with the sweet aroma of freshly baked bread every day! This 1 1/2 lb. 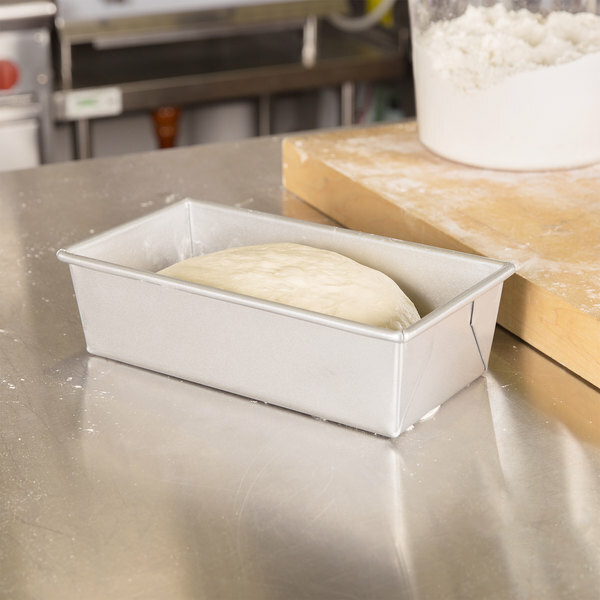 bread loaf pan is made of durable aluminized steel for excellent heat conduction and features a silicone glaze for easier release. Bottom Length : 9 3/8"
1 1/2 lb. Loaf Non-Stick Aluminized Steel Bread Pan - 12 1/4" x 4 1/2" x 2 3/4"
1 lb. 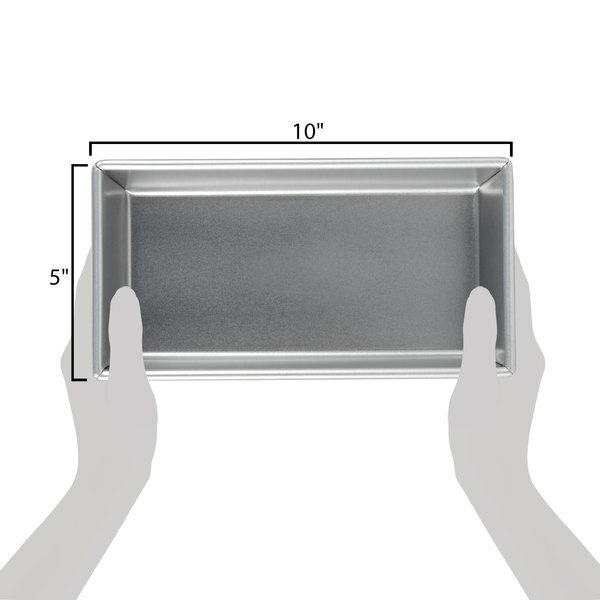 Loaf Non-Stick Aluminized Steel Bread Pan- 9" x 4 1/2" x 2 3/4"
Advance Tabco 18-8A-13 Half Size 18 Gauge Aluminum Sheet Pan - Wire in Rim, 18" x 13"
Overall User Rating: 1 1/2 lb. Loaf Non-Stick Aluminized Steel Bread Pan - 10" x 5" x 3"
In addition to baking breads, I have also used this as a lasagna pan. It is thick and heats evenly and creates beautifully browned breads. Also fantastic for my multi-layer, thick lasagna. The 1 1/2 lb Bread Loaf Pan 10"x5" Is great for any bread, from banna to plain wheat, ect. We sell several laoves of bread. The loaf Pans are esay to clean and wont rust. Great quality loaf pan. This is a very sturdy build and is great for baking breads and anything else you can think of. The price is phenomenal for what this offers. Making delicious banana bread has never been so easy! This is durable, easy to clean, easy to store, and most importantly, it's just shiny enough that you could use it to distract a velociraptor should you find yourself in a kitchen with one like in Jurassic park. I have had an opportunity to use this pan now about a dozen times. It is absolutely awesome. The weight and even heating is perfect. I use this pan for bread only so far and I have tried it with spray release, butter, oil, and nothing at all. The bread slides out with no sticking whatsoever, even when there is no release product used at all. So unless my recipe needs the butter or oil coating, I don't spray this pan. I highly recommend this product. This pan is nice and heavy weight. I used it to bake a surprise inside cake and it turned out perfectly. The inside is very slick and nothing stuck and it cleaned up easily. We received the pans in time to make 15 loaves of bread. They are very sturdy and do require that you "pre-season" them. DO NOT stick them in the dishwasher and make sure to use a paper towel between each one when stacking. I only gave this 4 stars because they cook very differently than most bread pans. It seemed to cook the bottom faster so I had to adjust the temperature on my stove. Overall a very good and solid product. We use these for our large sized loaves of bread that we sell wholesale to restaurants and cafes. You get about 22 slices per loaf and they're a nice size. Used this bread loaf pan to make a meatloaf. Very good choice for that. Sturdy as can be. Haven't had a problem with it at all. Excellent loaf pan! I use this size pan primarily for larger pound cakes. I love the light finish on the pan as opposed to the dark nonstick coating used by other brands. Plus I love the sharp, non-rounded corners. What a perfect bread pan! these are larger enough for sandwiches but easy to clean! We make a house sourdough and will do variations with poppy seeds and sesame seeds. 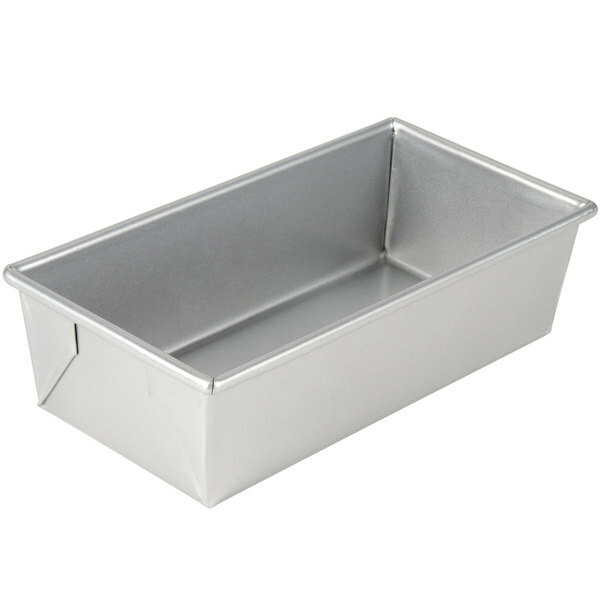 Great pan for breads and other risen baked goods. These pans have a nice coating and are generally well made. Will buy more for our baking needs. I love these bread pans, they are the perfect size for a sandwich loaf. They heat evenly and lend a nice even brown on the crust. Much better then other pans I used in the past. Cooked my bread evenly and when greased with shortening bread comes out cleanly. Will buy agian. Recently Tested these pans for a couple of our Breads. Very Pleased. I hope the results continue for a long time. Will update this review in a few months. Thank you for your review! We are sorry this bread pan did not work as well as you had hoped for making meatloaf. We recommend trying this 2 lb. 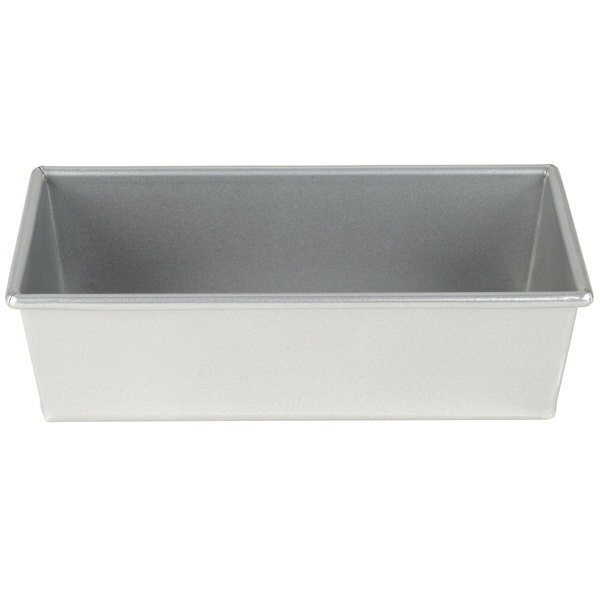 Vollrath Wear Ever 5436 Aluminum Loaf Pan for an alternative with a seamless design. My 2 pound loaves of bread worked great in this pan, very nice to have and I will be ordering 3 more. This is a keeper. These Bread Pans are THICK and are well made. They conduct heat well, so your finished product (Bread) is always delicious. Great Value at Webstaruant Store! I purchased 4, and will be ordering a couple more sets! This bread pan makes a wonderful loaf of bread. They bake evenly and do not burn the bottom of my bread. They are heavy duty and have held up beautifully. I have given a couple to my mother who also loves them as well....Not once has any loaf stuck to the bottom, just flip the pan over and the bread falls out. Highly recommend! Best loaf pans I have ever had. My bread comes out nice and high and the loaves are a good size. It is hard to find large loaf pans in retail stores. I will guard these with my life. I bought a dozen of these pans for use in my cooking classes. I was extremely pleased with the weight and the construction. 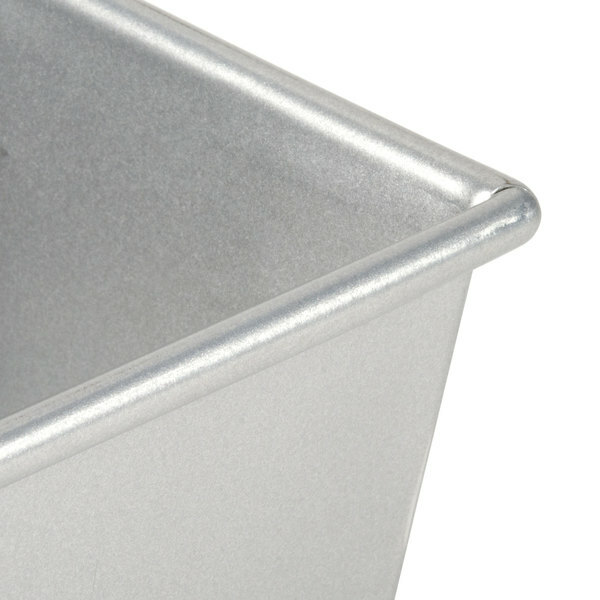 It is a wonderful, heavy-duty loaf pan to have in your kitchen! This bread loaf pan works great for us. We mostly use it to make meatloaf for our Panini sandwiches, it make the perfect size for our bread. Great size for larger cakes. I use this for my Almond and Pound Cakes and this is a great size for larger groups. Pan quality is fantastic and no need to worry about sticking - just use baker's spray. Perfect perfect loaf pan. This pan bakes bread loafs beautifully and is easy to clean and seems very durable. I was particularly happy with how webstaurantstore had the dimensions of the pan sizes in thier product description. It allowed me the buy loaf pans very close to the size of the ones I already use which is great. I bought this Bread loaf pan for home. it is so well made and my bread came out so easy.my old bread loaf pan went in the garbage and i wil be buying more of these. Great quality pan. This pan is perfect for use in our house. We use it to cook banana and pumpkin bread in particular which it is perfect for. This pan would be great for in-store or in-home use! I love this pan and am going to order more. I love how my quick breads bake evenly so there is no waste with end pieces that slope. it cleans up great too!